Along with the joys of childhood aka candies, chocolates and all sorts of sweets comes a rite of passage almost everyone goes through -- cavities. This is the situation we found ourselves in as Berry started complaining of non-stop toothaches. Nothing we did, not the regular visits to our old dentist, could help. This called for a miracle-worker na -- so we searched far and wide, asked around, bugged friends, family, and other dentists we knew. 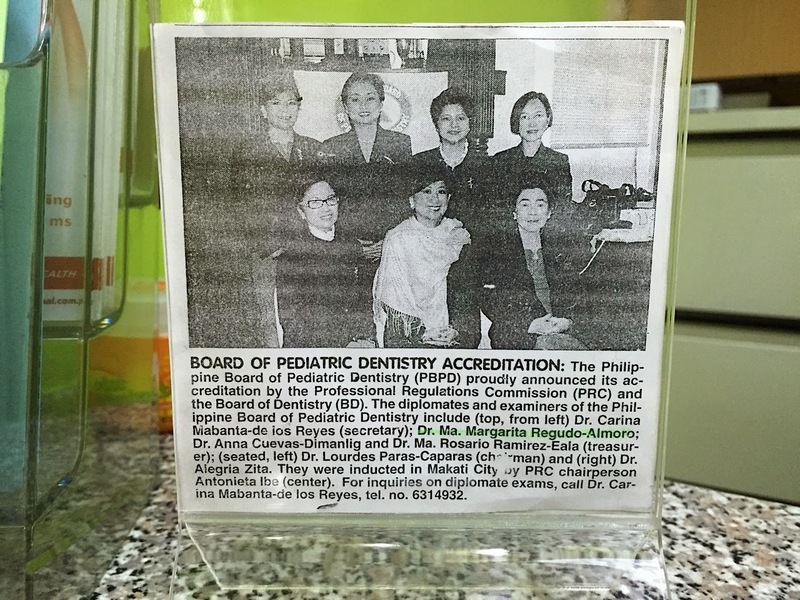 Our search led us to Dr. Mayee Regudo-Almoro, a diplomate, board member and examiner of the Philippine Board of Pediatric Dentistry and a member of the Philippine Pediatric Dental Society. 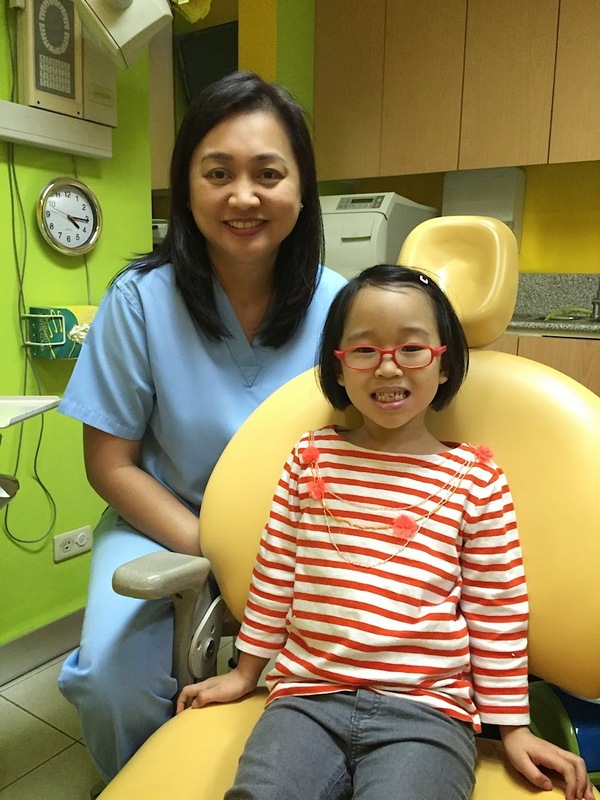 Like Dada, she spent some time in Boston, where she took her Master’s Degree in Pediatric Dentistry at the prestigious Boston University-Goldman School of Graduate Dentistry. Since she passed our initial qualifications check with flying colors (hehe), Dada and I lost no time in getting an appointment and brought Berry to her clinic in St. Luke's QC. She examined Berry's teeth, took a series of x-rays, and showed us a live video feed of the "problem spots". I liked that she took all the purposeful steps necessary to fully assess the state of Berry's teeth. Unfortunately, she confirmed what I've been dreading to hear. Most of Berry's molars needed to go through remedial procedures - some were even beyond saving. Sometimes, when you are faced with tough decisions to be made on behalf of someone you love, like your child, it becomes very hard to distinguish one decision from another. Thankfully, Dr. Mayee was very knowledgeable and she laid out several options and provided us a view on possible outcomes. 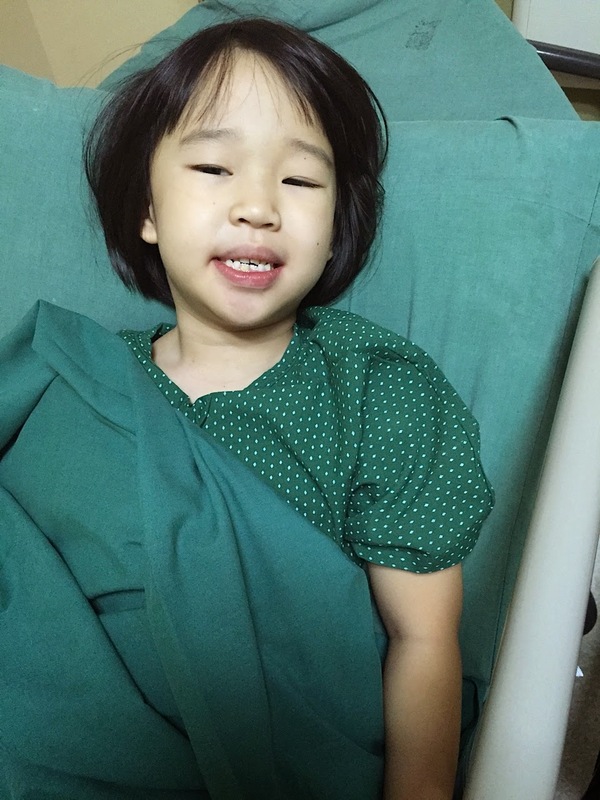 The first option was to have Berry's teeth treated (including possible extractions) individually in a normal dental clinic setting -- however, this would require several visits and, we surmised, not a small deal of trauma. The second option was to undergo an outpatient procedure at St. Luke's Medical Center Quezon City where Berry would be partially sedated while the entire procedure was carried out. Dr. Mayee patiently provided us with the pros and cons of each option and answered each imaginable question we had. We appreciated the fact that she did not insist on either option, but allowed us to make the final decision. Ultimately, Dada and I decided we wanted to spare Berry the trauma of repeat visits and opted for the outpatient procedure. Berry smiling after her dental operation, yay! It wasn't any ordinary procedure. With the extent of the tooth damage we witnessed, we're talking of a root canal, teeth extractions, fillings, fitting for a space maintainer, the works. Of course we were nervous! It was one thing to see your child complaining of a toothache, but the idea of getting her sedated, was nerve wracking to say the least. Nakakaawa even if nakakainis sya that it led to this! Thankfully, Berry's dental operation was a success, and our experience with Dr. Mayee was a good one. She gently but firmly guided us through the entire process, told us what to expect, and calmed our fears. This is why I want to share with you the lessons I learned the hard way and, for me, these lessons are worth their weight in gold when it comes time to choosing your child's dentist. You don't have to go through what we went through, if you do it right the first time. 1) Bring your child to a dentist as soon as the first tooth comes out. 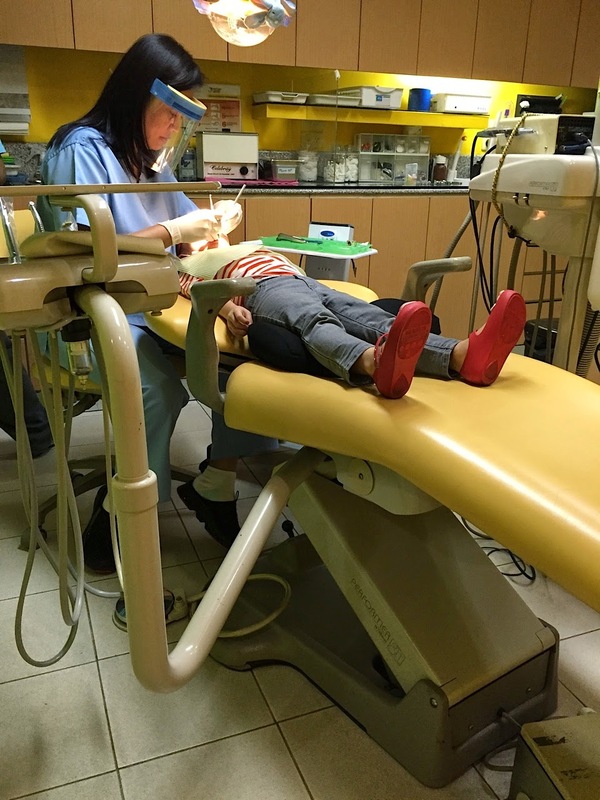 Even if it just means having her sit at the dentist's chair, so she gets used to the idea of going to a dentist even before she needs any cleaning or filling. It will help her get comfortable at the dentist's chair, saving you a lot of trouble for when any actual procedure needs to be done, if at all. In fact, Dr. Mayee says children can grow up cavity free. The point of early dental visits is for mothers to learn how to clean baby teeth properly, understand correct feeding and eating habits, be aware of the bad habits that cause tooth decay, know the correct products to use, and have the dentist perform proper assessment if there are problems early on. 2) Look for a pediatric dentist straight away. I used to think going to our regular dentist was good enough. After all, I grew up going to my parents' dentist. Not all kids are built the same though, and if your child is anything like Berry, who gets fidgety in a dentist's chair, then go for someone who is trained to deal with kids (for more info, visit www.pbpdonline.com) day in and day out. We were impressed with Dr. Mayee's ability to work with Berry, given Donya Beriray's, shall we say, "grit" and "persistence"! 3) Go for highly-recommended pediatric dentists. As with anything, go for tried and tested pediatric dentists, those respected by fellow dentists and loved by their patients. When it comes to your family's health, don't settle simply for what's geographically convenient or the least expensive option. Look at the big picture and think of what will be good for the long term. I have to admit, I brought Berry to my dentist because it was convenient. Not realizing that all those visits where she refused to be treated correctly were just a waste of time, effort and money in the long run. One trip to Dr. Mayee and all her teeth issues were resolved. Imagine if we brought Berry to Dr. Mayee from the beginning! 4) Get a pediatric dentist who is thorough, answers all your questions, gives you options, and runs you through the pros and cons. I liked that Dr. Mayee was very patient in answering all our questions and addressing our concerns. Getting your child's teeth pulled out, with a root canal done as well, is no easy matter. There really was a lot of hand holding and explaining that needed to be done, and Dr. Mayee was tireless in our "kakulitan". Even after our consultation, Dr. Mayee made herself available to take my calls and answer follow-up questions. After the operation, she made sure to check up on Berry's progress on a regular basis. When we decided to go for the total operation, Dr. Mayee's husband, Dr. Romel Almoro, who was also Berry's anesthesiologist, personally called us the night before the operation to remind us not to feed or give Berry anything to drink hours before the operation. On the day itself, he turned out to be a very funny guy -- that said, he was very effective in keeping us informed about what to expect, was right beside Berry the entire operation to monitor her, and made himself available to take our calls in case we had any concerns. We didn't have to call him because he told us what to expect, and it helped ease any fears. Nevertheless, he still called us that evening to check on Berry. Needless to say, Dada and I were impressed with them both. That's the kind of doctors you want on your side. 5) Be firm. If your child needs drilling to get a cavity filled, then just have it done, whatever it takes. A pediatric dentist should be equipped to deal with your stubborn child. Dada says I was too lenient with Berry, letting her have her way in refusing to be drilled. If I was more firm in getting her teeth fixed right away, and if I was quick enough to shift to a pediatric dentist early on, maybe her molars would have been saved. 6) Supervise your child's brushing. Most kids hate to brush their teeth. They usually just do an obligatory run through, which is not enough to clean every surface. If you have to do the brushing yourself, do it. Just to make sure every tooth gets brushed correctly, at least twice a day. Make sure to use fluoride toothpaste, and floss their teeth too. I will do a more thorough post on this, as taught to me and Berry by Dr. Mayee. Why all the trouble for milk teeth you ask? Well, my mom's sister died of rheumatic heart disease, which is caused by abscesses in baby teeth that are left untreated. She passed away at 29, which made my mom & I very conscious about caring for our children's teeth. It's easy to say, "Oh, it's just milk teeth, it will be replaced." But the reality is, milk teeth is important not just for aesthetic reasons but also for proper digestion, and in guiding permanent teeth to their proper place to prevent crowding later on (hence the space maintainer that Berry had to have on, because she lost some molars). I tell you, toothaches can be stressful. It was so frustrating when Berry would complain about her teeth, I swear. Thankfully, we don't have to worry about it anymore, save for the regular cleaning and check-ups. In fact, Dr. Mayee's goal is for her patients to just visit her twice a year for cleaning and check-ups, and that's the goal we want for all three kids moving forward. Really, if there's one advice I have to give parents of young kids, it's this. Take care of your children's teeth early on and don't wait until it gets really bad. If you've reached the point of no return like we did, then go for a dentist you can trust. For us, seeing Berry smile is extra sweeter, after all she's been through! Thanks Dr. Mayee -- see you in a couple of months for Berry's next appointment! 279 E. Rodriguez Sr. Blvd., Quezon City 1102. Telephone number is (02) 721 7003. For more info on Pediatric Dentistry, visit the Philippine Board of Pediatric Dentistry and Philippine Pediatric Dental Society websites. Thanks for this post, Tin! I am currently stressing over our kids' teeth — especially our toddler's! I am guilty (and ashamed!) that I did not take care of them as well as I should have. :( If you don't mind me asking, may I know how much Berry's procedure cost in total? 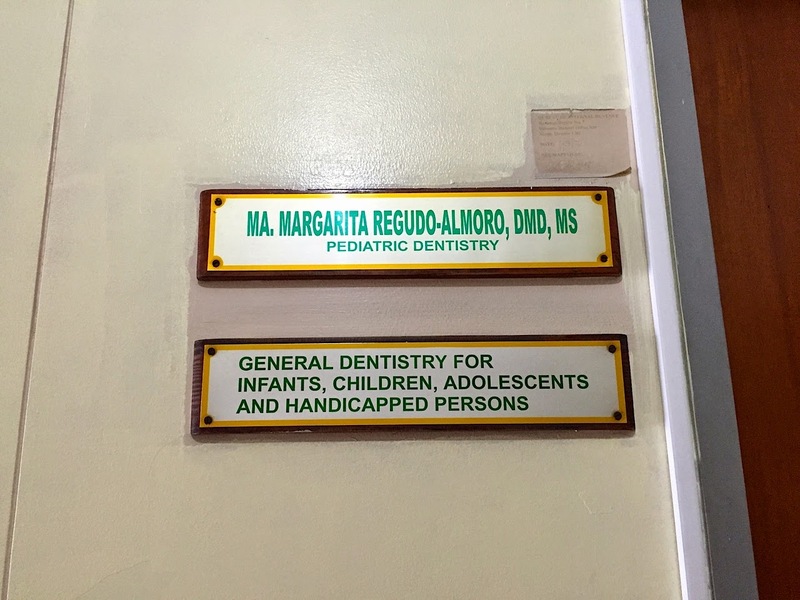 The pediatric dentist we went to see for our kids' teeth, at the Pediastric Dentistry Center in QC, says that our youngest needs to undergo a procedure under anesthesia too — but I'm SO scared for her! :( And the cost is a bit steep, since it's better that she be under GA daw because she's so young pa. Can you please share how much you guys spent for Berry? If you don't mind doing so, please do email me via tina@trulyrichmom.com. Thanks in advance! God bless! Sent you email. Hope you found a good dentist. Saw your article on pediatric dentists for Smart Parenting by the way! Madam Padam is too cute! You're welcome Minell! Stress when they complain about their teeth! And there's a feeling of "where did I go wrong" pa. Hay! I hope Madam Padam's molar can still be saved! Hi Tin! Madam Padam's molar had to be removed but amazingly, our madam was very cooperative. I was worried initially as she gets scared easily (the mere sight of a fly or cockroach will send her running around). She did have a lot of question to the dentist but it's a relief there wasn't any crying. 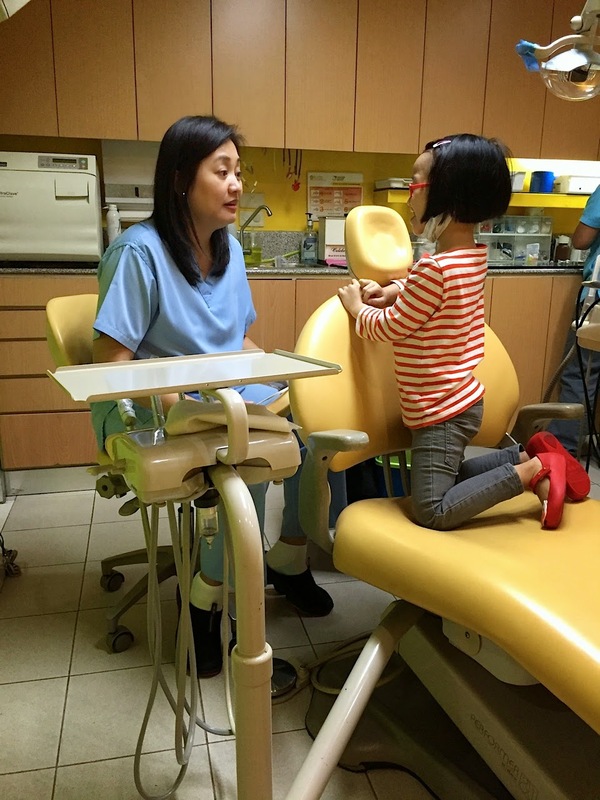 Glad that her first tooth extraction is a positive experience:) I had introduced 'The Tooth Fairy' to my 2 girls but this one is not counted right, hehe:) Did you also introduce The Tooth Fairy to Donya Beriray?